You need to inherit from this class if you want to implement K*NumInput for a different variable type. Definition at line 49 of file knuminput.h. parent If parent is 0, the new widget becomes a top-level window. If parent is another widget, this widget becomes a child window inside parent. The new widget is deleted when its parent is deleted. name The name is sent to the QObject constructor. Definition at line 62 of file knuminput.cpp. below A pointer to another KNumInput. Definition at line 68 of file knuminput.cpp. Definition at line 92 of file knuminput.cpp. You need to overwrite this method and implement your layout calculations there. See KIntNumInput::doLayout and KDoubleNumInput::doLayout implementation for details. Implemented in KIntNumInput, and KDoubleNumInput. Call this function whenever you change something in the geometry of your KNumInput child. Definition at line 128 of file knuminput.cpp. Sets the text and alignment of the main description label. label The text of the label. Use QString::null to remove an existing one. a one of AlignLeft, AlignHCenter, YAlignRight and AlignTop, AlignVCenter, AlignBottom. default is AlignLeft | AlignTop. 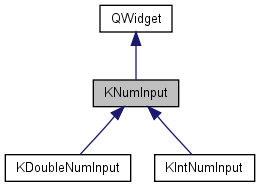 Reimplemented in KIntNumInput, and KDoubleNumInput. Definition at line 101 of file knuminput.cpp. Sets the spacing of tickmarks for the slider. Definition at line 195 of file knuminput.cpp. if the num input has a slider. Definition at line 98 of file knuminput.h. Returns a size which fits the contents of the control. Definition at line 190 of file knuminput.cpp. Specifies that this widget may stretch horizontally, but is fixed vertically (like QSpinBox itself). Definition at line 185 of file knuminput.cpp. Definition at line 1165 of file knuminput.cpp. Definition at line 146 of file knuminput.h. Definition at line 140 of file knuminput.h. Definition at line 142 of file knuminput.h. Definition at line 139 of file knuminput.h. Definition at line 144 of file knuminput.h. Definition at line 143 of file knuminput.h. Definition at line 52 of file knuminput.h.